I don't understand your objection to CC0. I read back through several of your links. Is your objection solely that the term "Creative Commons" appears? In any case, I always enjoy your blog - keep it up! i carefully worded, never said "licensed as PD" but "PD dedication"
"...you can't make something public domain just by saying that it is." This work is not copyrighted. It is the product of algorithmic, heuristic, and/or stochastic processes and is not a manifestation of creative expression. As such it does not qualify as a "work of authorship" under U.S. copyright law and consequently this work subsists in the public domain. 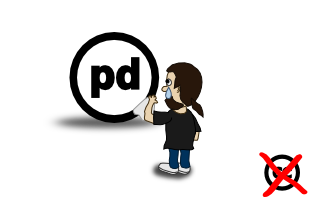 Even if saying ‘This is PD’ isn’t legally sound, people have a common understanding of what it means to them. However the US sees PD, outsiders view it differently in that it can be a product of a person. I mostly am with Nicu here, the public understands CC0 less than they do of PD, and it will discourage re-use. @Emily: that's a nice one! The reason I embraced CC licenses (except CC0) is their user friendliness, I think is important for the user to recognize his rights from the start, not needing additional research, that's why I also support PD dedication, everybody has heard about it already.